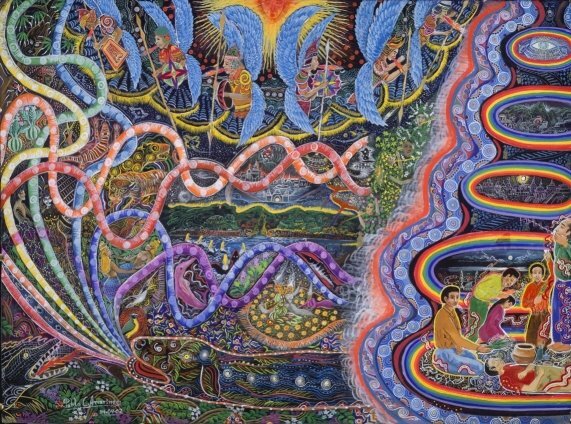 Pablo Amaringo is one of the world’s great visionary artists. He is renowned for his highly complex, colourful and intricate paintings inspired by his visions from when he was an Ayahuasca shaman. 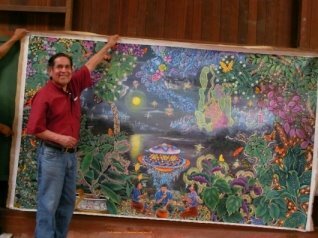 He trained as a curandero or healer in the Amazon, healing himself and others from the age of ten, but gave this up in 1977 to become a full-time painter and art teacher at the Usko-Ayar school of Amazonian art which he founded. 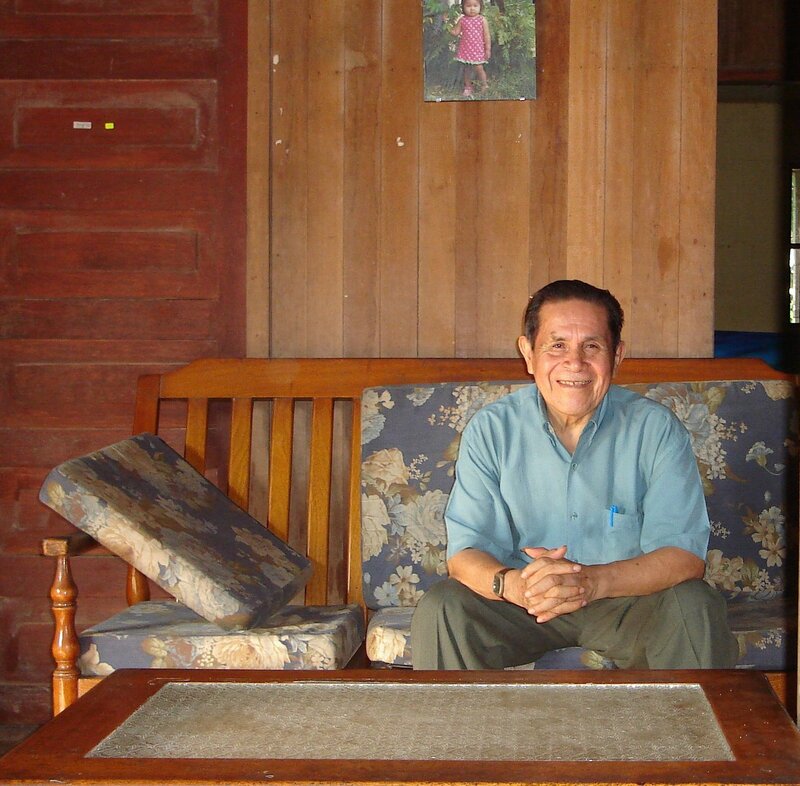 His book, Ayahuasca Visions: The Religious Iconography of a Peruvian Shaman, co-authored with Luis Eduardo Luna, brought his work and the rich mythology of the Amazon to a wide public in the West. This special event consists of a ten day workshop and Ayahuasca retreat with Pablo Amaringo in the beautiful heart of the Amazon Rainforest at a dedicated Retreat Center in the Allpahuayo Mishana Nature reserve. Each day, Pablo will hold a hands-on Art workshop; participants will enjoy the unique experience of learning the art of visionary and nature painting with Pablo. This workshop is suitable for beginners as well as experienced and proficient artists. Each night we offer traditional Ayahuasca ceremonies with Shipibo Shamans, Enrique Lopez, and an elder maestro – Benjamín Ochavano or Leoncio Garcia (depending on the number of participants). Also we will have available shamanic plants, plantas maestras, which enhance dream intensity and visionary and sensory perception, such as Guayusa and Ajo Sacha. This workshop-retreat is also a journey of self-exploration through the medium of Art and Ayahuasca, with guidance from Pablo Amaringo and our Maestro Shamans. Click to view Pablo’s Video Invitation to this workshop. “Its a good idea because people would see something of Mishana as well as what lies ahead in their lives. In fact through drawing they can learn so much more from drinking the ayahuasca. It will help them to understand their environment and value it more, wherever they live”. To learn to care for and respect plants, to look after the rivers, the water ….. as well as their homes and family. … we should value animals too. For me as an artist, my concentration in the Amazon is of great value because the truth is, without plants and animals, we couldn’t live”. So the invitation is for everyone who wants to appreciate more and know… in this case to learn how to learn. Question: “how could the workshop help people in their creative process”? 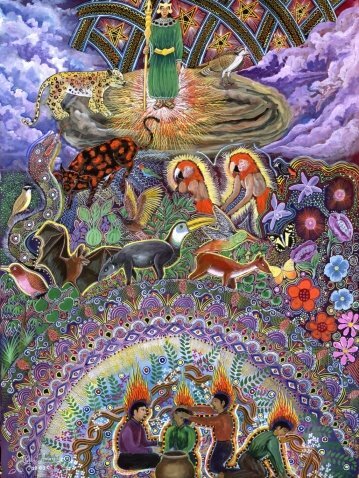 “Ayahuasca teaches when people start to see colours and forms…… the motifs and composition of a plant, an animal or a person ….. or elements like the clouds…… they can learn to see the molecules of ayahuasca which themselves are based on colours”. “When I do this work myself, I realise that every plant has leaves but they’re all different…. each one a style of its own, they can never be the same, nature is full of wisdom! Its divine, the roots too are all different, branches, flowers. That’s how I learned to paint – from nature – I never learned from books or teachers…. nature gives the structure”. Pablo’s paintings represent a reliable testimony to how the indigenous people of the Amazon live in constant awareness of spiritual realms. The Shipibo for example, have a strong presence in the region where Pablo lives and are one of the largest indigenous groups in the Peruvian Amazon having their own language, traditions and culture. Today they number about 20,000 and live in communities along the Ucayali River and around Yarinacocha, an oxbow lake near Pucullpa. The Shipibo world is under laid by intricate geometric patterns of great complexity and is displayed in their art. This concept of an all pervading magical reality challenges the Western linguistic heritage and rational mind. The patterns are an expression of the oneness of creation, the inter-changeability of light and sound, the union or fusion of perceived opposites. It is an ongoing dialogue or communion with the spiritual world and powers of the Rainforest. The visionary art of the Shipibo brings this paradigm into a physical form. Pablo’s painting classes are a creative form of entertainment. Like story telling, they bring Amazonian legends and fairy tales to life. These consider cosmic questions such as the origins of human consciousness and the power of the imagination. Many legends speak of a ‘time of the ancestors’ when humans regularly communicated with the spirits, and sensed and moved like animals and birds with whom they could converse. This era occurred before the rational mind separated us from the mysteries of the cosmos, a loss sorely lamented to this day but which – thanks to Ayahuasca – can be reversed. These are some of the themes of Pablo’s Amazonian School of Painting. This programme will take place in the Mishana Private Retreat Centre. We have 57 Hectares (140 acres) of land with a lodge in the Allpahuayo Mishana National Reserve in the department of Loreto, Peru. Our lodge is located directly on the river, which is part of the 58,070 hectare nature reserve. Due to a combination of geological factors and diverse soil types, the reserve supports a unique community of plant and animal species. It is the ‘jewel’ in the crown for bird watchers and contains dozens of species, which are unique to this area. The Reserve contains one of the highest biodiversities known in the Amazon basin. Our Lodge is located directly on the Rio Nanay, a tributary of the Amazon River. The mild acidity of its black waters are not popular with mosquito larvae and this means there are virtually no mosquitoes. The journey to our lodge from Iquitos takes two hours in our power boat. We are situated in-between two bends of the river giving an amazing panoramic view. The boat is always available so trips can be made to some interesting, and extraordinarily beautiful places along the river. We work with maestro Shipibo shamans Benjamin Ochavano, Enrique Lopez, and Leoncio Garcia. We will work with two of the shamans listed above on this programme. Included in the program are individual personal healing or consultative sessions with our shamans, based upon your personal needs. The maestros will also provide teachings about the fascinating medicinal and psycho-spiritual properties of the local plants. 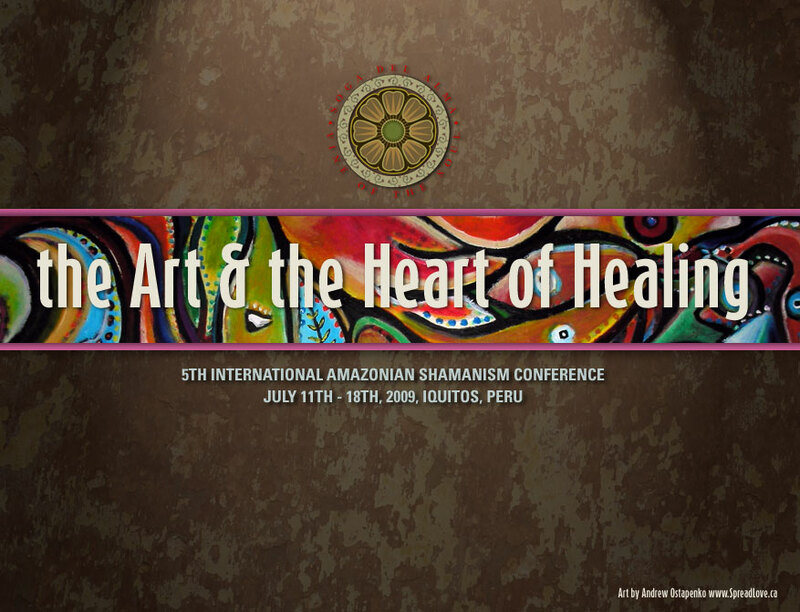 The Visionary Art Workshop with Pablo Amaringo is a post event workshop of the 5th International Amazonian Shamanism Conference: July 11th – 18th 2009. I have to say, Pablo’s drawings are very beautiful. It is very hard to even materialize what I’ve witnssed until the powers of mother ayahuasca onto paper or even description.